As the saying goes, knowledge is power. Helping your little heroes understand the "why" of being green is a good place to begin. There are plenty of books to explain sustainability, and the library is a great place to start. The internet is of course also a fantastic resource with a grown-up’s guidance. In the city of Chicago, our little champions see green garbage trucks on their way to school all the time. Make a game out of finding waste that can be diverted from the landfill and into the truck. Teach them about the recycling symbol so that they can sort garbage for the household. Creating charts to collate their results can help them see the impact of their actions. Even better than recycling something is re-using it. Children love creative projects, so how about turning a yogurt pot into a sparkly crayon holder, or taking a cereal box and repurposing it as a colorful caddy to store artwork? Utilizing stainless steel water bottles rather than purchasing endless plastic ones is another easy way to show them how to fulfill this goal. Working together to save the planet appeals to children’s community spirit. Picking up litter is compelling to youngsters, so try carrying a garbage bag when you’re out and about for impromptu clean-ups. Encourage them to enlist friends in their quest to save the planet by suggesting school initiatives—for example, collecting old sneakers. Superheroes are always generous. Donating to toy drives is a great way to go green, especially when it involves diverting all those plastic play things from going into a landfill. Taking clothing to thrift stores helps to prolong their lifecycle while supporting worthy causes at the same time. Conserving power is a big part of saving the planet. Talk to your amazing kids about the concept of energy so they have an understanding of what they’re trying to preserve. Turning lights off is a simple but visually impactful way they can participate. Opting to walk rather than drive, when possible, also allows them to make positive choices that save energy. Help little advocates understand that decisions around food can also impact the planet. Buying local saves all that wasted energy of transporting product. Visiting the Green City Market and selecting regional produce that’s in season can be a fun activity when they write their own shopping lists. Similarly, have them create a meatless menu for another positive activity they can share in. Children really love to grow things. Composting allows them to indulge their love of all things gooey and gross. Then using this material to grow their own vegetables gives them the chance to participate in a longer-term project, while developing scientific learning and patience, to boot. 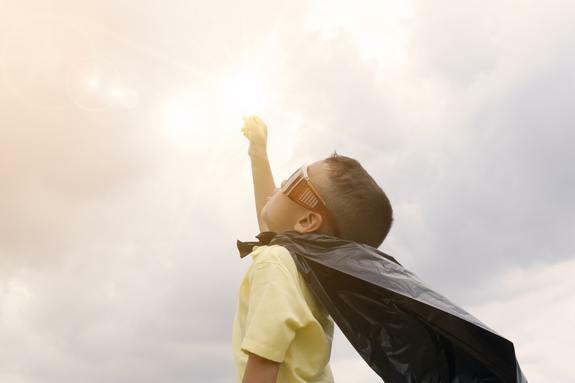 Even little superheroes can have a big impact on the planet. Fiona Royer lives in Lincoln Park with her husband, Randall, and their three young children. Originally from the U.K. with a business and creative background, she now works in the Chicago philanthropic community. She believes that giving is the key to a fulfilling life.